After Friday’s pre-cleanup adventures, we arrived at the park early Saturday to get the big day going. It didn’t take long before our expectations were blown clear out of the water by a completely amazing and diverse group of volunteers. 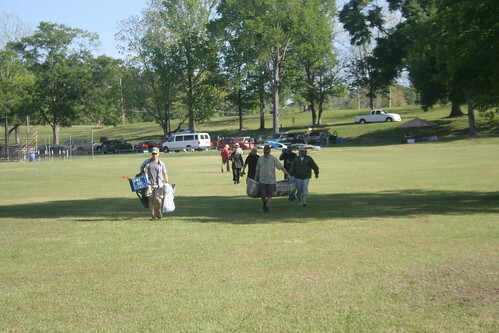 Practically as soon as we were starting to rig up the Canoemaran, people and boats began arriving at the park. Bayou Manchac Group volunteers. Friends from the Sierra Club. 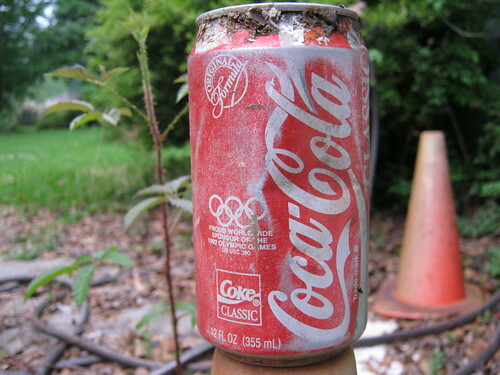 Leave No Trace people. Media. Somewhere along the way I pretty much completely lost track in the hustle and bustle. It was fantastic. 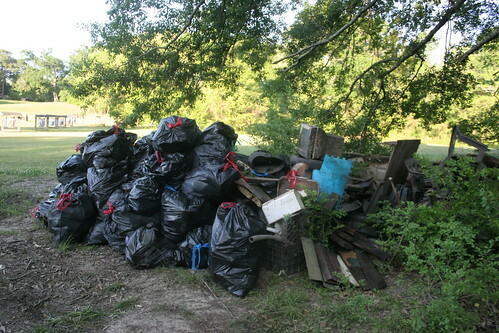 I *do* know that we had at least 21 people at the park and on the bayou, all helping out on the Saturday before Easter. Seeing so many people all out paddling on the bayou was unbelievably amazing. The months we spent working on the logjams and blockages were all so people could actually paddle Bayou Fountain, and now, here was a large group of paddlers. Not only were all these people out paddling “our” bayou, but they’d come out to enjoy it *and* to make a *HUGE* difference in the litter problem. Having everyone spread over the entire bayou was amazing. 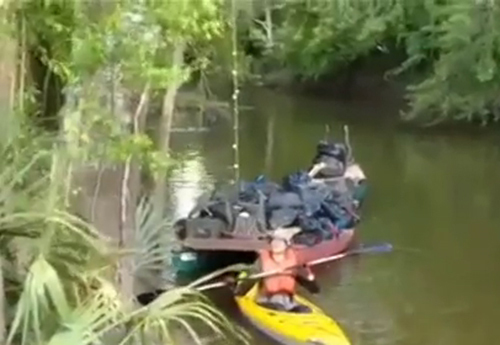 The Canoemaran group paddled past several other groups working litter rafts and headed on down the bayou for the long haul (and I mean that literally, both “long” and “haul”). Our fleet was composed of five kayaks, one manned canoe, the Canoemaran, a trailer canoe, and a towed wooden pirogue. The Canoemaran would skip from one collection to the next, with kayaks collecting the background litter along the way and going headlong into the litter rafts. It was impressive, as was the flotilla we left behind working upstream. We want to profusely thank everyone who came out to help with the cleanup. 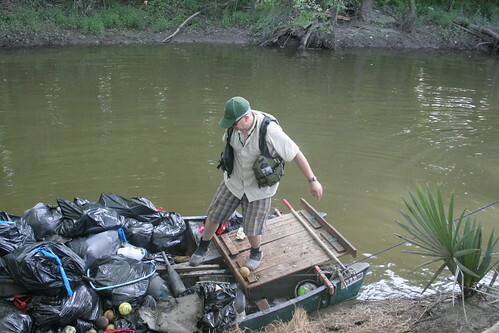 We’ve gladly spent months of long days of hard labor working on Bayou Fountain to get it into a state where paddling is now possible, but we needed help to tackle the litter problem. We asked for help, and you delivered in spades. To see so many people making such a tremendous impact on “our” bayou has us more grateful than we can do justice, but you have our deepest thanks. We look forward to you coming back to enjoy *your* bayou in the future, and we’ll be out there enjoying it and doing whatever work comes up. We’ve all turned it into the Bayou Fountain Paddle Trail, and there’s no way we’re going to give that up. 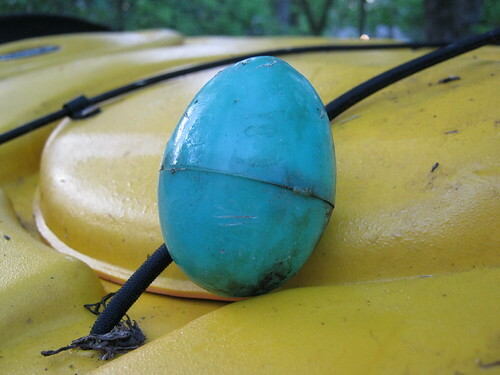 Oh, and by the way, we called it “The Great Bayou Fountain Easter Egg Hunt”, and you know what I found a few miles down the bayou? Woo-hoo!